The Bedford Eye Care Centre and AMD Alliance International want you to know that millions of people are at risk of vision loss from macular degeneration. Click on the link below to test your vision and pass this email on to family and friends to make them aware of the need for early detection through regular eye exams. Click on this link to begin. 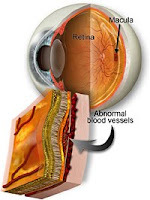 "Wet" macular degeneration occurs with formation of abnormal blood vessels and leakage in the back of the eye (retina), affecting the macula where fine focusing occurs. The AMD vision test is a dramatic illustration of the effects of macular degeneration. I hope everyone will pass it along to others who may be at risk of developing this disease.